Recent Pew Internet reports have noted that internet connectivity is increasingly moving off the desktop and into the mobile and wireless environment, particularly for specific demographic groups.6 Understanding an individual’s technological environment is now a vital clue in understanding how that person uses the internet, connects with others and accesses information. Among teens, the average person owns 3.5 gadgets out the five we queried in our survey: cell phones, mp3 players, computers, game consoles and portable gaming devices. In September 2009, adults were asked about seven gadgets: cell phones, laptops and desktops, mp3 players, gaming devices and ebook readers. Out of a possible seven gadgets, adults owned an average of just under 3 gadgets. Young adults ages 18-29 average nearly 4 gadgets while adults ages 30 to 64 average 3 gadgets. And adults 65 and older on average own roughly 1.5 gadgets out of the 7. 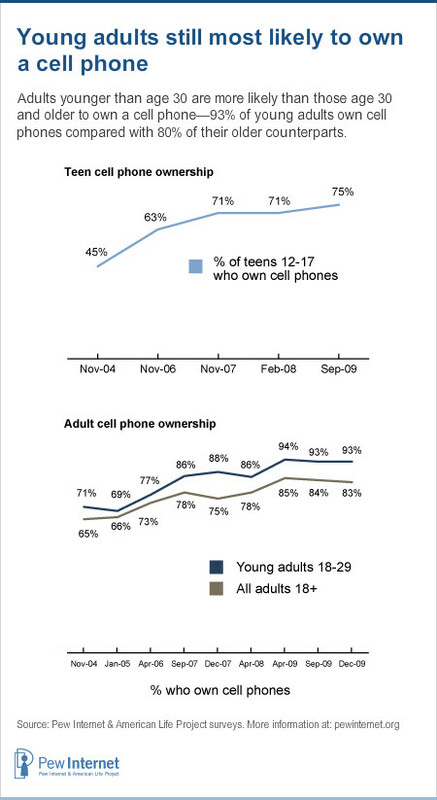 Majority of growth in teen cell phone ownership is among younger teenagers. Some 75% of American teens ages 12-17 have a cell phone. Since 2004, age has consistently been one of the most important factors in predicting cell phone use. Younger teens, particularly 12 year olds, are less likely than other teens to have a cell phone. As of September 2009, 58% of 12 year olds have a cell phone, much lower than the 73% of 13 year olds and the 83% of 17 year olds who own a mobile device. Much of the recent overall growth in cell phone ownership among teens has been driven by uptake among the youngest teens. In 2004, just 18% of 12 year olds had a cell phone of their own. In the same 2004 survey, 64% of 17 year olds had a phone. Cell phones are nearly ubiquitous in the lives of teens today, with ownership cutting across demographic groups. Beyond age, there are few differences in cell phone ownership between groups of teens. Boys and girls are just as likely to have a phone, though they do not always use it in the same way. There are no differences by race or ethnicity in phone ownership by teens. Socioeconomic status is one area where cell phone ownership rates vary, with teens from lower income families less likely to own a mobile phone. More than half (59%) of teens in households earning less than $30,000 annually have a cell phone, while more than three quarters of teens from wealthier families own one. By way of comparison, as of December 2009, 83 percent of adults owned a cell phone (or Blackberry, iPhone or other device that is also a cell phone). 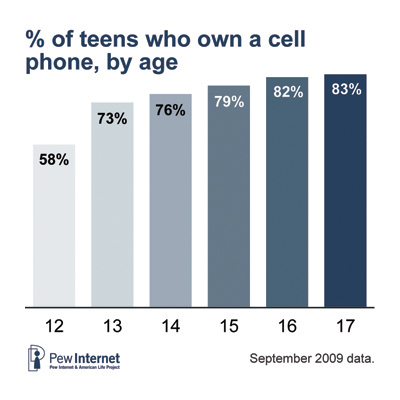 This is an 18 percentage point increase since Pew Internet began tracking cell ownership in November of 2004; at that time, roughly two-thirds of adults (65%) owned a cell phone. Adults younger than age 30 are more likely than those age 30 and older to own a cell phone—93% of young adults own cell phones compared with 80% of their older counterparts. 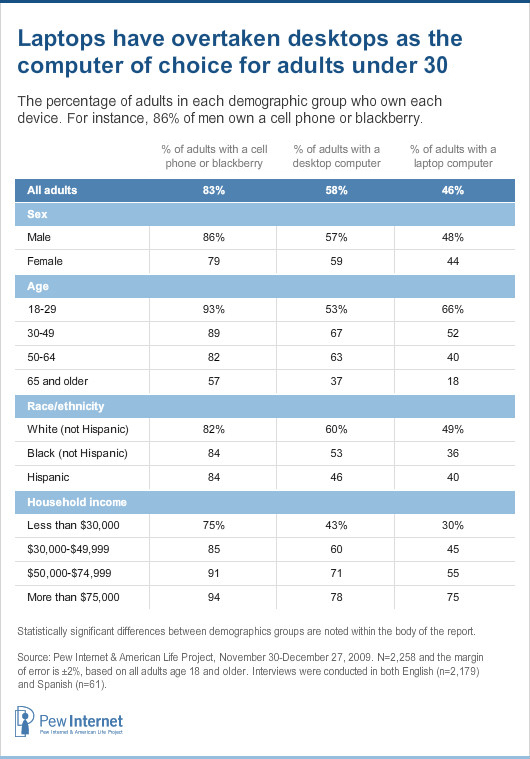 Cell ownership drops off after age 50: 82% of those ages 50-64 own a cell phone, and 57% of those 65 and older own one. Among all adults, cell phone ownership increases with educational attainment and income, and men are more likely than women (86% v. 79%) to own cell phones. As we see in the teen population, there are no racial or ethnic differences in cell phone ownership among adults. Nearly seven in ten (69%) teens ages 12-17 have a computer. Teens from wealthier families earning more than $75,000 a year are slightly more likely (74%) than less well-off teens to personally have a desktop or laptop computer. Older teens are also more likely to report owning a desktop or laptop; 73% of 14-17 year olds have a computer while 60% of 12 and 13 year olds do. Among adults, desktop computers are slightly more popular than laptop computers and netbooks. Overall, six in ten adults (58%) own a desktop computer, compared with 46% who own a laptop or netbook. However, while laptop computers have been increasing in popularity among adults over the past three years, desktop computers have been decreasing in popularity. Laptops have overtaken desktops as the computer of choice for adults under 30. It is important to note that young adults – those under age 30 – are significantly more likely than all other adults to own a laptop or netbook, and among this group, laptops have overtaken desktops in popularity. Among adults ages 18-29, 66% own a laptop or netbook while just 53% own a desktop. As with cell phones, computer ownership rates increase with rising educational attainment and income. White adults are more likely than Hispanic adults to own a desktop computer, and are more likely than both African American and Hispanic adults to own a laptop computer. Music and E-Books: Young adults & teens are more likely to have an mp3 player than other adults. Nearly four in five teens (79%) have an iPod or other mp3 player. 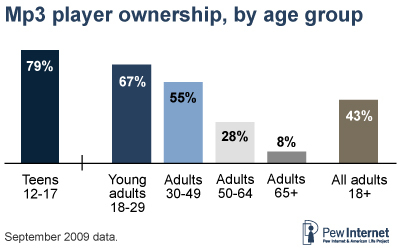 Ownership of music players cuts across most demographic and age groups, with all groups just about as likely to own an mp3 player as another. The exceptions to this are parent’s educational attainment and family income. 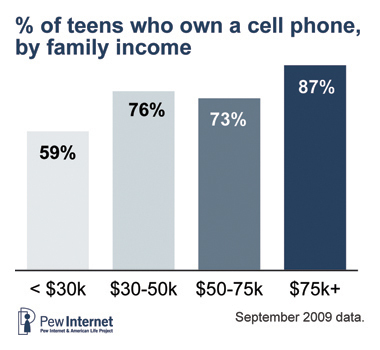 Unsurprisingly, as family income and education rises, so does the likelihood of a teen owning an mp3 player or iPod. Young adults & teens are more likely to have an mp3 player than other adults. In September 2009, Pew Internet asked adults about a larger number of gadgets: computers, mp3 players, game consoles, portable gaming devices, and e-book readers. Among these different gadgets, mp3 players are most popular with adults (43% own one), while just 3% of adults own an e-book reader. Mp3 players are especially popular with young adults. With numbers that match teens, fully three-quarters of 18-24 year-olds own an mp3 player; that compares with slightly more than half of 25-29 year-olds (56%) and 30-49 year-olds (55%) and just one fifth of adults age 50 or older (20%). As with other gadgets, mp3 ownership is positively correlated with educational attainment and income. 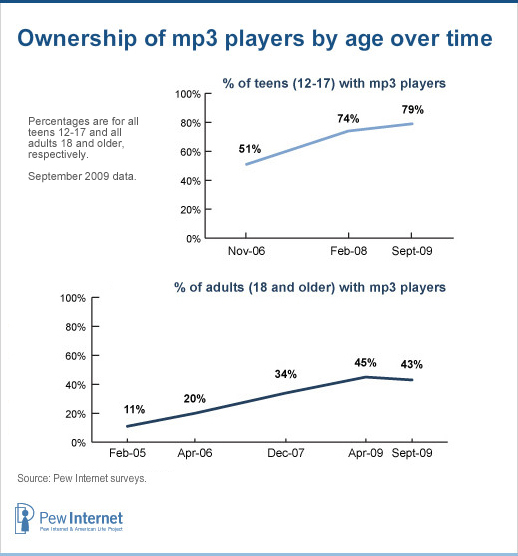 Ownership of mp3 players by adults has risen steadily since the question was first asked in January 2005, when just 11% of adults owned a digital music player. Among teens, the percentage of teens with an mp3 player has also increased significantly, from 51% of teens in November 2006 to nearly 80% today. 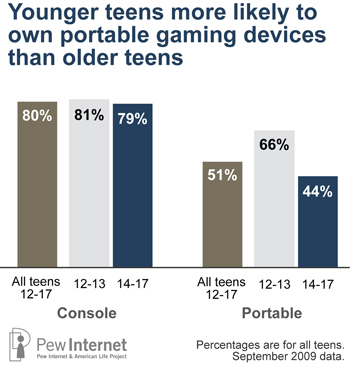 Teens are enthusiastic consumers of gaming devices both wired and portable. Fully 80% of teens between the ages of 12 and 17 have a game console like a Wii, an Xbox or a PlayStation. While younger and older teens are equally likely to have a game console, boys are more likely than girls to have one. Nearly 9 in 10 (89%) boys have a game console, while 70% of girls report ownership. Younger teens, ages 12 to 15 are more likely to own a game console than 16-17 year olds. Half of teens (51%) have a portable gaming device like a PSP, DS or a Gameboy. Unlike other tech gadgets, portable gaming devices are more often owned by younger teens, with two-thirds (66%) of teens ages 12-13 owning a portable game player compared with 44% of 14 to 17 year olds. As with consoles, boys are more likely than girls to own a portable gaming device; 56% of boys own one, as do 47% of girls. Beyond the age and gender differences in ownership, portable and console gaming platforms are equally likely to be found in households regardless of race, ethnicity, household income or parent’s education. Adults 30 and older are much less likely to own a game console than teens or young adults. Overall, 37% of adults report owning a game console like an XBox or Play Station, and 18% report owning a portable gaming device such as a PSP or DS. Not surprisingly, adults under age 30 are more likely than older adults to own gaming consoles, but they are not just for the very young. While 59% of adults under age 30 own a gaming console, that number drops just eight percentage points to 51% among 30-49 year-olds. 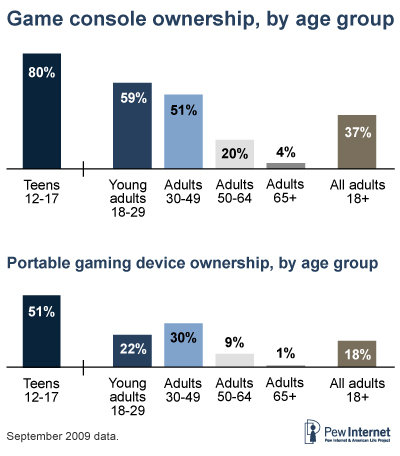 Moreover, 18-29 year-olds are less likely than 30-49 year-olds to own a portable gaming device (22% v. 30%). There are also gender differences in this area; men are slightly more likely than women to own a game console (39% v. 34%), while women are slightly more likely to own a portable gaming device (20% v. 16%). Access to the internet is changing. Teens and adults no longer access the internet solely from a computer or laptop. They now go online via cell phones, game consoles and portable gaming devices in addition to their home desktop or laptop computer. Overall the computer remains the most popular way for teens to go online, with 93% of teens with a desktop or laptop computer using the device to go online. But other more portable technologies are also now providing new paths to the internet. Among teen cell phone users, more than a quarter (27%) say they use their cell phone to go online. 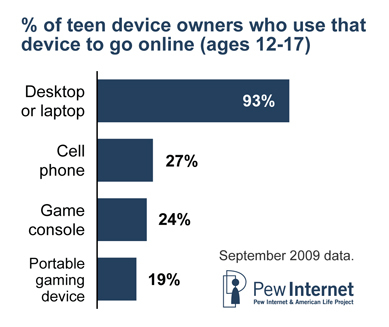 Similarly, 24% of teens with a game console (like a PS3, Xbox or Wii) use it to go online. Other handheld gaming devices also allow internet connectivity—among teens with a portable gaming device, about one in five (19%) use it for this purpose. Most adult internet users (63%) access the internet using multiple devices; this is especially true of adult internet users younger than age 50, of whom 70% access the internet with more than one device. As of September 2009, 54% of adults accessed the internet wirelessly. 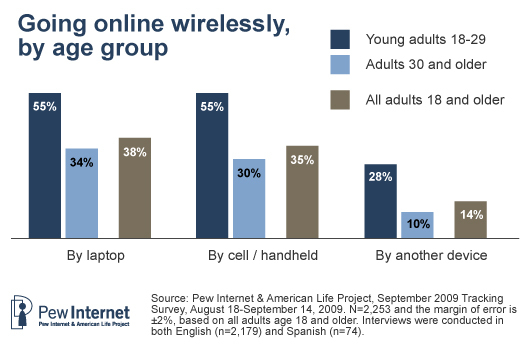 The most common means of wireless access among adults is the laptop computer, with 38% of American adults reporting that they access the internet this way. Accessing the internet via a handheld device is as common among adults as access via a laptop—35% of adults report that they access the internet using a cell phone or other handheld device. One in seven adults (14%) access the internet wirelessly through a device other than a laptop or cell phone such as a gaming device. Wireless rates are especially high among adults under age 30; eight in ten adults between the ages of 18 and 29 (81%) are wireless internet users. That figure drops to 63% among 30-49 year olds, and 34% among adults age 50 and older. Roughly half of 18-29 year olds have accessed the internet wirelessly on a laptop (54%) or on a cell phone (55%), and about one quarter of 18-29 year olds (28%) have accessed the internet wirelessly on a device other than a laptop or cell phone. 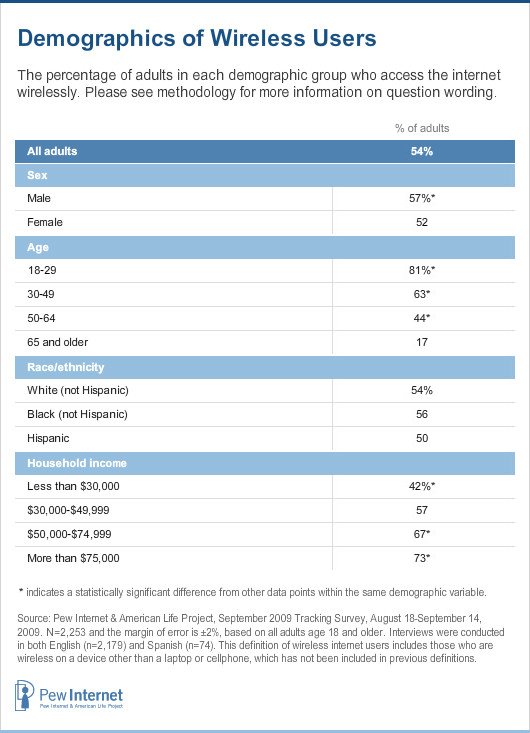 Among internet users, white adults are less likely than both African Americans and Hispanics to use the internet wirelessly. African Americans are the most active users of the mobile internet, and their use is growing at a faster pace than mobile internet use among whites or Hispanics. While African-Americans are less likely than whites to use laptops to access the internet, they are more likely to use other mobile devices such as cell phones. Half of all African-American adults (48%) have used their cell phone to access the internet, compared with 40% of Hispanic adults and just 31% of white adults. Men, and adults with high income and education levels are the most likely to access the internet wirelessly. Gender, education, and income are all related to wireless internet use. Overall, men are slightly more likely than women to be wireless. While men are no more likely than women to use wireless laptop connections, they are more likely to access the internet wirelessly via a cell phone or other device. Wireless internet use, particularly wireless laptop use, is positively correlated with educational attainment and household income. While wireless cell use and wireless internet use via other devices is also positively correlated with educational attainment and income, the impact is not as strong.